Slythe Seringi was a Dunmer warrior who owned Shetcombe Farm just northeast of Kvatch. He is only enabled at the beginning of the related quest, along with the sack nearby and his journal. It seems that Slythe was suffering from some misplaced guilt over the events at Kvatch, and that's why he took a trip to nearby Sandstone Cavern. 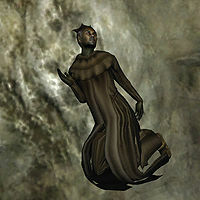 According to him, the cave hosts a creature called The Sunken One, that was responsible for the destruction of Kvatch, and he tried to defuse the situation by offering him a tribute of precious gems. Unfortunately, his well-intended sojourn didn't work out, as you will find him dead in one of the larger rooms in the final zone of Sandstone Cavern. It appears that the Sunken One has sealed his fate. According to the first page of his journal, Slythe decided to rely solely on his will and his word when facing The Sunken One. The second page of his journal describes his doubts during the journey. He entered the cave with no weapons or armor at all, wearing nothing but a monk robe and a pair of clogs. On his body, you will also find the third page of his journal, clearly a dying man's last words. This page was last modified on 24 March 2018, at 22:40.